Smooth and glowing skin is a luxury that many of us are not blessed with. A majority of us are left with skin that is blemished, scarred and flawed with stretch marks. Stretch marks are caused when our skin stretches beyond the point of its elasticity and as a result lead to breakages in the collages fibres, leading to long, silvery streaks of line on the skin surface. Definitely not a disturbing skin problem that requires immediate attention. But considering the mental trauma and the social impact that a stretch marked skin can cause you, they are surely a serious issue. Women especially are very sensitive to the problem of stretch marks as they prevent them from wearing clothes that they would otherwise love to wear. Stretch marks initially appear as red or purple streaks of lines on the skin surface, mainly on the thighs, breasts, buttocks, stomach etc. These shades appear when the tissues stretch over their limit and bleeding occurs on the dermal layer of the skin. As time passes, the redness disappears and silvery streaks appear which never fade away completely. The reasons for developing stretch marks could be many. The most common reasons however are being overweight and the expansion of skin due to pregnancy in women. Deficiencies of certain vitamins too can cause stretch marks. Sometimes, certain medications that you take for various ailments could lead to damage of skin tissues, leading to stretch marks. Adolescence is the time when many youngsters develop hormonal imbalances in their body and resultant stretch marks. Finally, stretch marks can be caused simply because you are genetically disposed too. 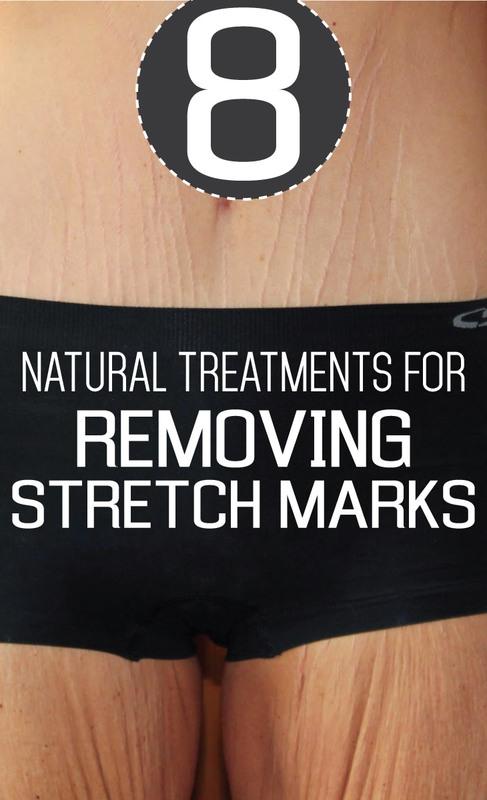 Home remedies can sometimes be the best treatment option for stretch marks, especially when the stretch marks are new. They can be repaired at this stage with results which are very satisfactory and irreversible. Cocoa butter is known to be one of the best home remedies available for the treatment and prevention of stretch marks. Most of the creams for stretch marks that are available in the market contain cocoa butter as the main ingredient. Massaging pure cocoa butter right on to the skin will help in preventing the formation of stretch marks, especially when you are pregnant. For making a cream with cocoa butter, fill half a cup with cocoa butter. Add a tablespoon of wheat germ oil and one teaspoon each of apricot kernel paste and vitamin E. Take two teaspoons of bees wax and melt it. Add this to the mixture and mix well. This nourishing cream can be used every day for massaging into your body. Olive oil is a great remedy for removing stretch marks. But if you are looking at something which is stronger, aloe vera is here to serve you as well. Take half a cup of pure olive oil and add a quarter cup of freshly extracted aloe vera gel to it. Mix to form a smooth paste. Take 4 vitamin E capsules and two vitamin A capsules and add it to the mixture by bursting the capsules. Mix the contents well and use it for massaging on the stretch marks every day. Store this cream in air tight jars to retain its freshness. Massaging the stretch marked skin with any oil will in fact do a lot of good by reducing the severity of the damage. The improved blood circulation and the plumping up of skin will eventually lighten the stretch marks to a great deal with a massage every day. For preparing a massage oil, take equivalent amounts of lavender and almond oil and add a teaspoon of chamomile oil to it. This can be massaged into the skin in gentle circular strokes. Do it every day and see the stretch marks getting flattened and lightened with time. Wheat germ oil is a common ingredient in cosmetic creams as wheat germ is rich in vitamin A and E which are necessary for beautiful skin. Wheat germ helps in repairing and regenerating the skin. Calendula has great healing properties and help in reviving scarred skin. Mix calendula and wheat germ in equal proportions and massage every day for 15-20 minutes. With every passing day, your stretch marks will reduce considerably. The application of vitamin E must be started immediately after the arrival of red streaks of lines on your skin. This is the time when the stretch marks can be completely removed with great care. Massage the skin thoroughly with vitamin E for twenty minutes. Massaging vitamin E before the appearance of stretch marks will prevent its occurrence greatly. Mix jojoba, avocado and sweet almond and add 2-3 drops of chamomile and lavender oil to it. Work it into a smooth paste and apply on the stretch marks every day. Avocado is a natural moisturiser as it has natural oils present in it. With constant application of this mixture, the skin will be smoother and lighter in days. Freshly ground coffee has to be made to form a paste with a cream or lotion of your choice. This can be rubbed on the skin for 10 minutes every day. The slightly abrasive nature of coffee will act as an exfoliant and help in flattening the stretch marks greatly. Rub twice a day for 15 minutes. Vitamin K creams are known to remove stretch marks. Massage onto the skin every day for its action to heal stretch marks. Food rich in vitamin K should also be consumed while you treat stretch marks to maximise the gains. With all these treatment methods, one must be aware of the limitations. Stretch marks are difficult to fade or remove completely once they are silvery grey in colour. The best treatment therefore is to prevent the stretch marks from appearing on your skin. All the treatment methods mentioned above are good for preventing the occurrence of stretch marks as well.